Papaya and pineapple enzymes are both classified as proteolytic enzymes, meaning that they digest proteins. Papaya enzymes are extracted from the leaves and fruit of the papaya plant and are collectively known as papain. Pineapple enzymes, or bromelain, are isolated from the stem of the pineapple plant and the juice of the pineapple fruit. Both enzymes are reputed to provide a wide variety of health benefits. Papaya enzymes contain several proteinases, or proteolytic enzymes, with anti-microbial and anti-ulcerative properties. As such, papaya enzymes are believed to help relieve a variety of gastrointestinal complaints, as well as stomach ulcers and pancreatic enzyme deficiency. In traditional Ayurvedic medicine of India, papain is used to treat bronchitis, hemorrhoids, urinary tract infections, kidney stones and parasitic infestations. In Western medicine, papaya enzymes are often used to remove diseased or dying tissue associated with infected wounds, cysts, diabetic ulcers, lesions and burns. In Africa, papaya enzymes are used to treat cancer and heart disease, as well as a variety of inflammatory conditions, such as arthritis. Pineapple enzymes are also used to treat digestive problems, as well as frequent heartburn, sometimes in combination with amylase and lipase, enzymes that digest starches and fats. In Europe, the German Commission E has approved the use of bromelain to control post-operative inflammation and congestion associated with surgeries involving the sinus cavities or throat. Like papain, bromelain is also used as a debridement agent to slough dead tissue from burns and other types of injuries. 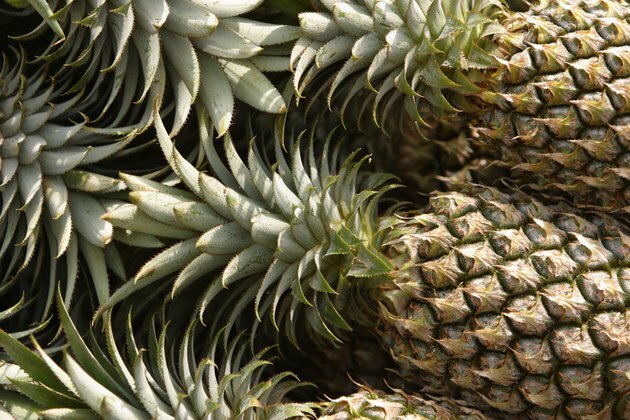 Applied topically, pineapple enzymes are thought to reduce pain and swelling. Other reported health benefits of bromelain include decreased pain and inflammation associated with sinusitis and rheumatoid arthritis. Since it would be necessary to consume large amounts of papaya or pineapple to get any medicinal effect, both enzymes are available in supplement form. Papain is prepared as a powder, and bromelain is available in capsule form or as chewable tablets. Topical applications of papain and bromelain are available to health professionals. The usual dosage for powdered papain is .25 tsp. dissolved in water taken just before meals. For bromelain, the German Commission E recommends a range of 80 to 320 mg, 2 to 3 times per day for 8 to 10 days. The level may be increased to 500 to 2,000 mg in 2 doses per day to aid digestion, to treat arthritis or to speed the healing of wounds. Papaya enzymes should not be taken during pregnancy due to an increased risk of miscarriage. In addition, papain may interfere with anticoagulants and antiplatelet medications. Bromelain also interferes with blood clotting and blood-thinning drugs, as well as a number of sedatives and antibiotics. Consult a health care professional before supplementing with papaya or pineapple enzymes if you are currently taking any medications.